We have a spectacular Super Sunday for you this weekend on Sky Sports - a triple helping of derbies in the Premier League. It all gets underway from 11am, as Fulham make the short trip to Stamford Bridge, where their new manager Claudio Ranieri is a familiar face - having spent almost four years in charge of Chelsea at the start of the millennium. Ranieri is one of seven former Chelsea managers to have faced his former club in the Premier League, and one of four to have beaten the Blues. His only win came as Leicester manager in December 2015 - in what proved to be Jose Mourinho's final match in charge of Chelsea. 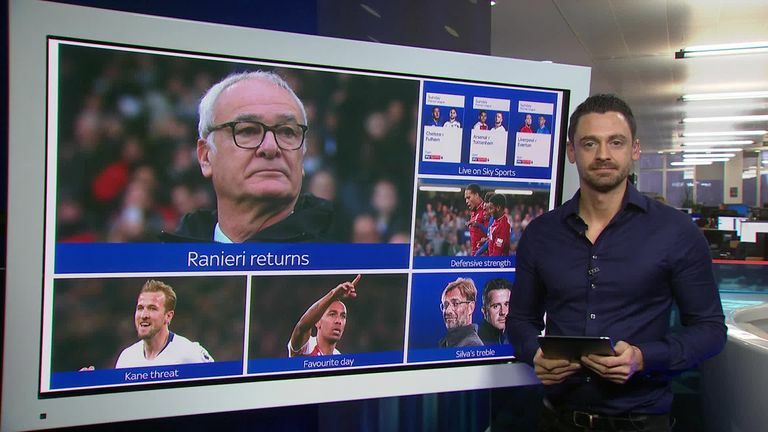 Another victory with Fulham on Sunday would see Ranieri become the first former Chelsea boss to register a Premier League win away at Stamford Bridge. Former Blues managers have only managed five draws and lost eight times from 13 visits against their old club. Ranieri also has the opportunity to become the first former Chelsea manager to beat his old club with two different teams in the Premier League. The second London derby of the day comes from the Emirates Stadium as Arsenal square up to rivals Tottenham. Harry Kane will lead Tottenham's attack after scoring his 25th goal in Premier League derbies last weekend - he's now tied in sixth place with former Arsenal favourite Robin van Persie for London derby goals. But Kane's goal against Chelsea last Saturday was his first this season from outside the box. After seven appearances this term, Kane had failed to have a single shot from outside the box - remarkable considering he had 62 in the Premier League last season. But Kane has rediscovered the knack in the six games since October - hitting 12 shots from distance and finding the net to put Spurs two up in their win against Chelsea. Meanwhile, Arsenal's Pierre-Emerick Aubameyang is the Premier League's joint-top scorer so far this season on eight goals. He is one ahead of Kane in the early race for the Golden Boot after scoring the winner at Bournemouth last Sunday. That goal on the south coast continued Aubameyang's outstanding record on Sundays - he has 14 goals in 16 appearances on Premier League Sundays, compared to four in 10 games on any other day of the week. That equates to a goal every 88 minutes on Sundays - the best rate of any player in Premier League history on that day. Completing Super Sunday's triple-header is the first Merseyside derby of the season. Marco Silva will become the latest in a long line of Everton managers to try and end their dismal run without a win against Liverpool - a streak that now stands at 17 meetings. Silva will complete a unique treble on Sunday: he will be the first manager in Premier League history whose first three meetings with Liverpool have been at three different clubs - and he is unbeaten in his previous two. For Jurgen Klopp, this is his fourth Premier League derby at Anfield, and Silva will be the fourth different manager in the opposition dugout - following on from Roberto Martinez, Ronald Koeman and Sam Allardyce. The Toffees have only scored three goals in their last seven trips to Anfield in the Premier League, and this time around they will face a Liverpool defence vastly improved from their visit 11 months ago. At this stage last season, Liverpool had conceded 18 goals, compared to only five this term. The Reds have actually faced more opposition shots during this campaign, but better goalkeeping performances and a more settled backline have made them a much tougher proposition at the back. In fact, the Reds possess the joint-best defensive record in the league, along with Manchester City. So, a blockbuster Super Sunday awaits and all three matches are live and exclusive on Sky Sports Premier League and Main Event from 11am.